The tribal chairman of the Red Lake Chippewa Band says the community is "devastated" by a shooting rampage that left 10 people dead. Authorities say a teenager fatally shot a teacher, a school security guard and five other students at Red Lake High School in northern Minnesota before taking his own life. About a dozen others were wounded. Red Lake, Minn. — (AP) - The boy accused of killing nine people in a shooting spree here first shot his grandfather, then donned the man's police-issue gunbelt and bulletproof vest before heading to the high school, where he shot students and teachers at random, authorities said. Michael Tabman, the FBI's special agent in charge of the Minneapolis office, said Jeff Weise appeared to be acting alone in Monday's rampage. When it was over, 10 people, including five students and Weise himself, were dead. At a news conference Tuesday, Tabman said he couldn't confirm whether Weise was the same person who made posts to a neo-Nazi site, including one in which the writer billed himself as the "Angel of Death." And he said authorities still didn't have a motive for the shootings. Investigators didn't know if there had been any confrontation between Weise and his grandfather. Initial reports had as many as 15 people injured in the shooting, but authorities Tuesday lowered that to seven. Five remained in the hospital, including two students with critical injuries from gunshot wounds to the head or face. Aside from Weise's grandfather, Daryl Lussier, and Lussier's companion, Weise's targets appeared random, Tabman said. An unarmed security guard and a teacher also were killed. It was the worst U.S. school shooting since Columbine. "Right now we are in utter disbelief and shock," said Floyd Jourdain Jr., chairman of the Red Lake Band of Chippewa. Weise may have posted messages on a neo-Nazi Web site, hosted by the Libertarian National Socialist Green Party, expressing admiration for Adolf Hitler, going by the nickname "Todesengel," which is German for Angel of Death. In the first posting under that name, the writer identified himself as Jeff Weise of the Red Lake Reservation. An April 2004 posting from him referenced being accused of "a threat on the school I attend," though it says he was later cleared. Kathryn Beaulieu, a school board member, said Weise was a student who had been placed in the school's Homebound program for some violation of policy. Students in that program stay at home and are tutored by a traveling teacher. Beaulieu said she didn't know what Weise's violation was, and wouldn't be allowed to reveal it if she did. Beaulieu said school was canceled Tuesday, but plans hadn't been made for the rest of the week. Beaulieu said Weise was a tribal member, and gave his age as 17; Tabman gave it as 16. FBI spokesman Paul McCabe said the shooter first killed a school security officer near the school entrance. At some point, he exchanged gunfire with Red Lake police in a hallway, then retreated to a classroom, where he was believed to have shot himself, McCabe said. One student, Sondra Hegstrom, described the gunman grinning and waving at a student his gun was pointed at, then swiveling to shoot someone else. "I looked him in the eye and ran in the room, and that's when I hid," she told The Pioneer of Bemidji. Relatives told the St. Paul Pioneer Press that Weise was a loner who usually wore black and was teased by other kids. Relatives told the newspaper his father committed suicide four years ago, and that his mother was in a Minneapolis nursing home due to a brain injury suffered in a car accident. Minnesota Gov. Tim Pawlenty said it appeared the school had "very rigorous security" in place. "It looks like you had a very disturbed individual who was able to overcome a lot of precautions to do a lot of damage," the governor said. But a school secretary and a cousin of the slain security guard, Derrick Brun, said that Brun and a female security guard who fled from Weise did not carry guns. Brun's cousin, Nancy Richards, said Brun didn't wear a bulletproof vest, either; it wasn't immediately clear if the other guard did. It was the second fatal school shooting in Minnesota in 18 months. Two students were killed at Rocori High School in Cold Spring in September 2003. Student John Jason McLaughlin, who was 15 at the time, awaits trial in the case. 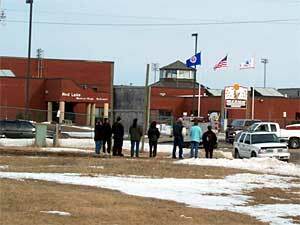 Red Lake High School has about 300 students, according to its Web site. The reservation is about 240 miles north of the Twin Cities. It is home to the Red Lake Chippewa Tribe, one of the poorest in the state. According to the 2000 census, 5,162 people lived on the reservation, and all but 91 were Indians. At the Capitol Tuesday morning, members of the Minnesota Senate bowed their heads and clapsed their hands during a moment of silence for the victims. Sen. Rod Skoe, DFL-Clearbrook, who represents the area around Red Lake, said, "I would ask that our thoughts and prayers be with those people and really with all of us as we struggle with these violent acts in our world." 5 years after Flint's crisis began, is the water safe?